Organizations don’t just need a more agile digital workplace to remain competitive — they need a more agile way to pursue that vision. That was one of the major themes of the Gartner Digital Workplace Summit that just wrapped up in Orlando, Florida. The Redbooth team was on site, including CEO Dan Schoenbaum, VP of Marketing Charles Studt, and Corporate Account Executive Johanna Sambyal. 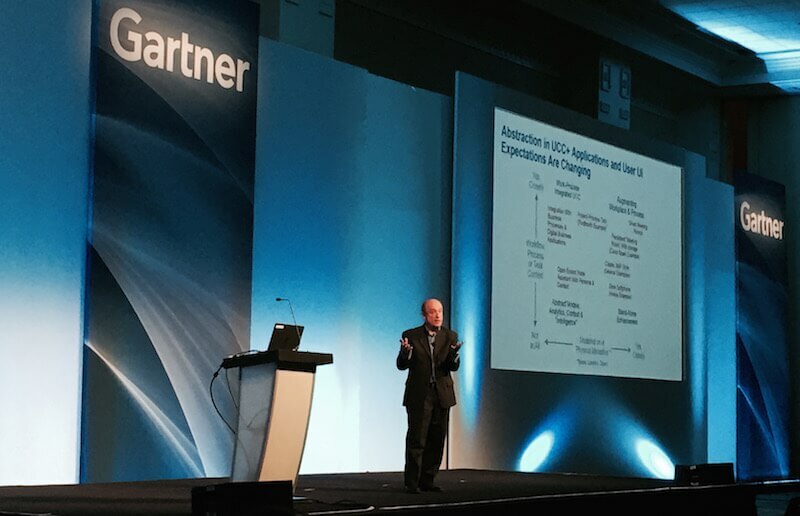 A steady stream of attendees came to talk with us in the exhibit hall about transforming collaboration and productivity after seeing Redbooth singled out as an example in a series of presentations — including the one pictured above, by Gartner’s Bern Elliot. They saw that making faster progress in workplace innovation required breaking free of traditional, conservative, slow-paced patterns in IT, and they were inspired to consider what kinds of transformations they might be able to bring about at their own organizations. While Gartner eschews outright product endorsements, its unified communications and collaboration (UCC) analysts recently named Redbooth a Gartner Cool Vendor and referenced it as an example in a report on “bimodal IT” for UCC. This bimodal strategy recognizes that the world is changing rapidly, with incumbent firms — and sometimes whole industries — threatened by upstart competitors using digital technologies to rewrite the rules of business. The plodding, conservative mode of IT that big enterprises have traditionally used to sustain themselves is no match for that kind of innovation. Those methodical processes, which Gartner refers to as mode 1, are still important when it comes to running transactional systems like ERP or managing data center storage. But firms that want to stay relevant need to embrace a second mode of operations. In mode 2, enterprises carve out a fraction of their IT effort to move faster and explore possibilities – including the possibility of working with innovative companies (like Redbooth!) rather than big enterprise systems vendors. When Gartner’s UCC analysts wanted to show an example of an agile, mode 2 strategy for UCC, Redbooth was the only vendor featured on the slide. Redbooth fits in the UCC category as a platform that gives team members multiple ways to connect and collaborate, from real-time communication to shared workspaces to discussions and file-sharing. Redbooth makes it possible to unify all these types of communication and collaboration…without the need to install specialized networking equipment or embark on a systems integration project. In other words, it doesn’t require a mode 1 “grand plan” involving stacks of architecture diagrams and a labor-intensive implementation. The digital workplace of the future that Gartner described at the conference is broad, inclusive, and exciting. It brings together UCC, or portals, and mobile computing with the emerging “Internet of Things” created by smart devices and intelligent systems that anticipate our needs. Combined intelligently, these technologies will boost productivity and organizational effectiveness. Bimodal IT is particularly relevant in this context. Improving the digital workplace is one of the most important things an enterprise can work on, in Gartner’s view. Yet many IT organizations never quite get around to focusing on it – or address it only in a very fractured, incremental way – because they are so busy with all the mode 1 “keep the lights on” activity. As Gartner analyst Jeffrey Mann pointed out in a presentation, the work related to upgrading and managing enterprise transaction and storage systems “expands to fill the available time.” As a result, a few small pockets of digital workplace innovation may pop up where a particular manager sees the potential. “But without an explicit mode 2 operation,” Mann warned the audience, “you’re never going to be able to take it further.” More conservative mode 1 operations are still important to keeping the business running, he added, but relying on them exclusively is not likely to lead to innovation. In the words of analyst Chris Howard, leaders want their people to be able to make “discretionary contributions to business effectiveness.” This means providing employees with a sense of investment in the success of their company by empowering them to contribute to that success. Surveys show that employees who believe they can positively affect business results and direction are more motivated and give higher ratings for job satisfaction, he said. And the right technology can facilitate employee impact, especially when it contributes to increased transparency, accountability, and productivity. A digital workplace is a necessity for competing in an increasingly digital economy. Mode 2 UCC technology — swiftly implemented, easily managed, and flexible — can accelerate the journey to a workplace that supports collaboration and innovation.